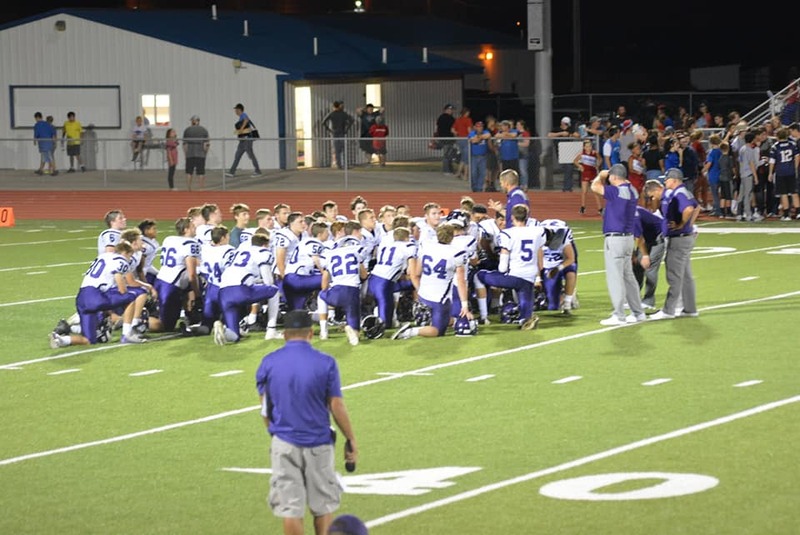 Last season the Russell Broncos took a 28-27 victory away from their meeting with the Southeast of Saline Trojans. It was the first loss for SES against Russell under Mitch Gebhardt. Friday night in Russell, the Trojans handed those Broncos their first loss of 2018. Both teams entered the game with two wins and no losses. For Southeast of Saline, it was the third and final league game in the North Central Activities Association before the teams start district play next week. Russell started with the football and could get nothing going on offense. Faced with a 4th and 25 and punting from their own end zone, the Broncos unleashed a punt towards midfield. As the football rolled around on the turf, the Trojans were walking off the field ready to start their first offensive drive. The Broncos however, picked the football up and ran into the end zone. After much conversation, the officials ruled a Trojan player had touched the ball and it was a live ball for play resulting in a Bronco touchdown and a 6-0 lead. SES would respond as they put together a lengthy drive that ended in a Bryant Banks 1-yard touchdown run. Aaron Kitchener would add the extra point as the Trojans claimed the 7-6 lead with 2:54 left in the first quarter. The next Trojan drive would be even more impressive. Starting at their own two yard line, SES would march 98 yards and score on a 2-yard run by Sophomore quarterback Jaxson Gebhardt. Kitchener would add the point after to extend the lead 14-6 with 5:20 left in the second quarter. Banks would score again with just 29 seconds left in the first half. The Kitchener kick would put the Trojans up 21-6 at halftime. Russell would come out aggressive in the third quarter and score on a 75-yard run by running back AJ Oste. Russell would pass for the 2-point conversion, pulling within a touchdown with 6:36 left in the third quarter. The two teams would exchange a couple turnovers but the Southeast of Saline running game would dominate the fourth quarter led by Bryant Banks. The Sophomore running back would score his third touchdown of the night as he ran 30 yards to the end zone and smashing a Russell defender on the way. Kitchener’s kick would cap the scoring as SES claimed a 28-14 win. Banks finished with 146 yards on 31 carries and 3 touchdowns. Kitchener finished 4 of 4 on extra point kicks and Jaxson Gebhardt was 10 of 13 passing for 130 yards. Southeast of Saline had 329 yards of total offense while the Trojan defense allowed just 179 yards. Southeast of Saline moves to 3-0 on the season and 3-0 in NCAA league play. The Trojans will start district play next week at home when they host St. Marys (1-2).